With the sector press regularly covering Stratum’s research, we’ve brought together some of the best. 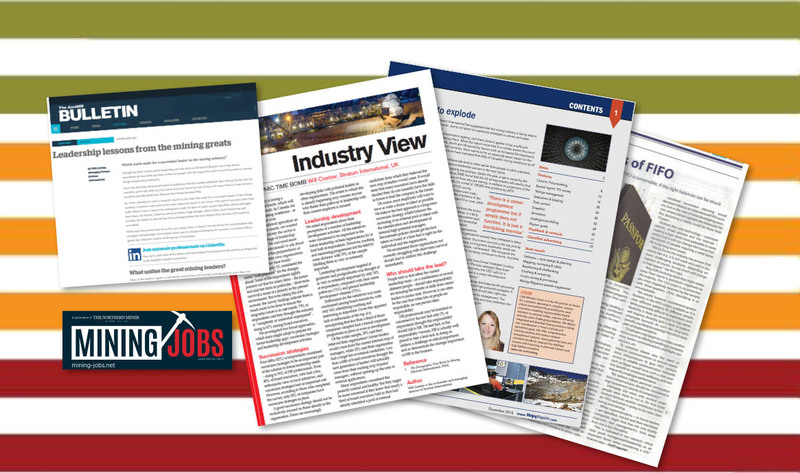 Over the last few years, Stratum International has regularly appeared in the mining sector media, often on the back of our exclusive research reports which have explored areas such as such as interviews with some of the great leaders in the sector, senior-level turnover in mining, the use of assessments in mining recruitment and FIFO rosters. We thought it was about time we brought some of these articles together in one place. So we’ve created a new page on our website, Stratum in the Press, where we’ll provide links to some of the best. With articles appearing in Mining Magazine, Mining Journal, Coal News, AusIMM Journal, Northern Miner and more, it’s a rich seam of bite-sized summaries of our research and thinking. And if you want the full story, you can download our reports in full from our Research Pages here. Why do we do mining research? This coverage is, of course, good for our business as it increases people’s awareness of Stratum International. But it’s hard-won coverage, and there are undoubtedly easier and cheaper ways of getting our name known. When we established Stratum, we always wanted to take the opportunity to put something back into the mining sector in the form of original and useful research. It’s an endeavour that has produced several well-regarded reports, our biannual state of the job market reviews and our blogs. Our research gives us a better understanding of the market so we can better serve clients and candidates. It has also helped us to develop new services to meet their unfulfilled needs; Assessments Assessed, for example, informed the development of TalentAssay™, while FIFO – A Global Perspective gave us an in-depth and unique understanding of the challenges candidates and their families face when working on rosters. And now we offer a research and consultancy service to clients who want to understand the market, the talent available and how to best attract and retain it. The press coverage helps spread the research with a wider audience – and it’s good for our egos of course! But the real pleasure comes in applying the new knowledge in our day-to-day work.